For generations Broken Hills rich history has been inspiring artists to create some of Australias most magnificent works. With over 20 public galleries and a variety of outdoor sculptures and murals, this city is truly defined by its art. 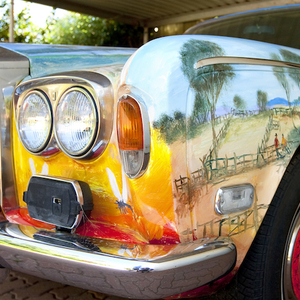 We have created three self-guided art trails to help you explore the rich art culture of Silverton and Broken Hill. Each presents a unique mix of iconic works, along with up-and-coming artists and the quirkiest galleries that make the areas art scene so vibrant. Lee,Jimmy and Mick are here to give you the lowdown on Silverton. The Demo Club are so proud of the newest venture 'Thyemon Argent' which has now successfully opened. The Club is now undergoing renovations in the gaming lounge. The Club is excited to share the renovations plans with all Members and Guests. There are several new additions to the existing Club including an extended Gaming Lounge, a new SPorts Bar and Oriental Restaurant. The building next door will be transformed into a gorgeous licensed Cafe and Function Centre serving wood-fired pizzas, gourmet pasta's, foccacias, tapas and much much more. The Function Centre will hold up to 200 people and will have modern decor throughout. This weekend in Broken Hill and Silverton is a biggy!!! On Saturday 14th we have the 50th Anniversary St Pat's Race Meeting. This is important to me, because, not only do I have a photography gallery at Silverton, my husband trains racehorses from our property and we have 3 horses racing at this meeting. Add to that the fact that hubby, Barry, is one of only four jockeys remaining in the Broken Hill area who rode at the first St Pat's meeting and you could say we're a bit excited. On Sunday 15th, Silverton is host to the 4oth St Pat's Silverton Recovery Day at the iconic Silverton Hotel, so there will be plenty of action around the village to keep people interested and entertained. Silverton Photography will be open all day Sunday (but closed Saturday for the races) and we would love to see all the visitors to the area. Hopefully we will have a winner for you to pat and get a selfie with. The gallery has lots on show, with prices to suit all budgets and we take all major credit cards. To get here, follow the signs from the Penrose Park turnoff on the Silverton Road. The signs will be decked out with green balloons and streamers. So come on folks, make the effort to leave the main road!! Call in and see us, you won't be disappointed. One of 53 finalists selected in John Villiers Waltzing Matilda Outback Art Show 2015 which opened on the 15 May at the Waltzing Matilda Centre and Regional Gallery Winton unfortunately a devastating fire destroyed the building and contents on 18 June all paintings were destroyed. Currently developing water colours from sketches from centralian trip. "It's sort of like the Galapagos Islands - this isolated group of people in the middle of nowhere have just evolved independent of anything else." The deep sense of identity the people of Broken Hill have in this environment is remarkable, and there's something about the place that draws people in and turns visitors into residents. But what is it? Working with over 25 local galleries in Broken Hill and Silverton, we are proud to announce the launch of a digital guide to the Galleries of the Broken Hill region. 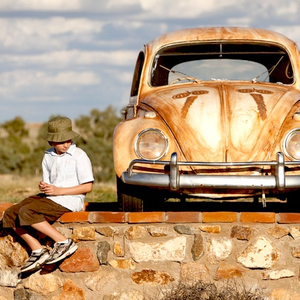 Click here and explore three seperate trails highlighting the diveristy of Broken Hill and Silverton's art community. Can you guess from which gallery we sourced our Hero shot? Visit the Horizon Gallery, meet Albert and chat about his work at the Horizon gallery in Silverton. An amazing array of work by featured artists, as well as Albert's own award winning paintings. The Outback has come to life, with a rare abundance of green to be seen across the sweeping plains. 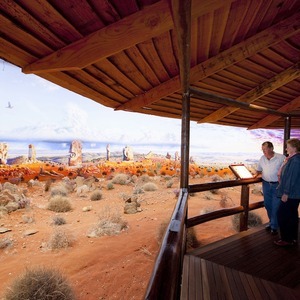 Be sure to stop at Mundi Mundi Lookout just outside of Silverton for breath-taking views of the Outback vista. 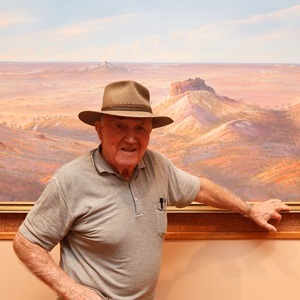 Whilst in the region, stop in to Justin Cowley's gallert in Silverton and wander his fantastic gallery, viewing work which captures the romance of the bush. Image courtesy of Justin Cowley (click here for more info).